About a year ago, I ran across Studio Koba during its successful Kickstarter run and was immediately blown away by its retro pixel art aesthetic and layers of meaning (you play a legendary digital hero in an epic quest through simultaneous dimensions). At the time, I reached out to developer Eduardo Fornieles and conducted an interview that set the bar for my interactions with indie studios. Since that time, I’ve kept up with Ed and Chie, leading to the following conversation regarding the project. Erik Meyer: The game juxtaposes beautiful, primal landscapes with urban environments, crafting 80s disk drives, monitors, and similar hardware into untouched natural splendor. Regarding this visual aesthetic, how did you decide to combine the elements in this way? Did you simply experiment with pixel art and arrive at an otherworldly setting, or did the background and lore of the digital kingdom lead to an alternate biological/geographical setting? Eduardo Fornieles: I can’t easily distinguish what came first or how it was combined. When I got a spark of the idea, Narita Boy was already standing in the digital kingdom. And I knew he came from the 80s and was a teenager boy. At first, I translated these images from my head into the graphics. Then more ideas, stories and images came to my head. Very often, visuals brought more stories. But it also worked the other way around. I didn’t try experimenting or challenging to combine the elements. All came naturally as a result of this process. My personal tastes and interests from that time reflect a lot in the work. I thought a floppy surfboard would be fun. So I added the scene and made the connection to the story. I visited a field with many fireflies in Japan. 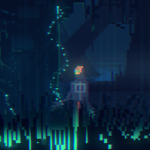 After that, I added the scene with the fireflies. I find beauty in the mix between organic and non-organic. That personal taste gave way to the blending between hardware and untouched nature. EM: You mentioned previously the fact that Narita Boy combines East and West, Spain and Japan, and I’d love to hear more on that. Certainly, we see shots of Narita Boy meditating, and the landscape includes staircases carved into mountains, not to mention robed figures wielding magic, but what other aspects do you find popping up in your work? EF: You will find homages to the 80s and 90s Japanese arcade games in Narita Boy. Last November, we released the gameplay of the scene from the 80s. The background looks like alleys in a rough area in New York, and that carries the feelings of the Japanese arcade games from the 90’s. In many of the Japanese games in the 80s and 90s, a combination of East and West already took place. For example, Street Fighter is a Japanese game but has quite westernized characters and backgrounds. So far, we don’t have Flamenco, Torero, or any Spanish symbolic items or scenes, but my childhood memories are based in Spain. In that way, through my nostalgia, you will find that Narita Boy is “made in Spain”. That is the only glimpse of Spain you might pick up on. Conversely, I have lived in Japan for 3 years, and my wife is Japanese. Unconsciously, I am inspired by Japan. So you will recognize more than a little inspiration from Japan in Narita Boy. EM: The crossover of worlds stands as a huge element of Narita Boy with Lionel Pearl at the center of the mystery, meaning that during the game, the digital kingdom and Earth have some overlap. What has kept you on task and on course with levels, content, and story additions, given the fact that a war between Stallions and the digital kingdom is spilling over into the mean streets of the 1980s? EF: I won’t go into much storyline detail, because I don’t want to spoil the mystery of Narita Boy before the game release, but I can confirm that the storylines are mostly in the digital kingdom and sometimes in the 80s. He migrates back and forth between the two, which I believe gives a good rhythm to the story and entertains the player. The player always finds something new at every stage: items, characters, mechanics, etc. I am trying to make the game that I want to play. So I am working to make sure the player doesn’t get bored. I have played many games that have wonderfully beautiful aesthetics. At first, I enjoyed these graphical beauties. But later I got bored and didn’t play to completion. I don’t want Narita Boy to end up only as eye candy. I aim to entertain the player throughout the game and put much effort into the mechanic (as much as visuals and story). In addition to the storyline, the enemies should be fun to beat. I focus on the whole package.